I've written a small freeware utility for the localization course I'm teaching at DU. I needed some source code for an exercise, and I thought I might as well write a small utility from scratch. The utility converts from American feet and inches to meters. There are many much better programs that convert feet, inches and thousands of other measurements, but so far I have not found any that converts feet and inches when they are presented together, for example when you indicate a person's height. This programs does that (and also converts pounds to kilos). You can download the program for free from this link (from our company's website). Please note that, in this beta version, feet and inches should be written as if they were a decimal number (5.9 for 5'9"). If you type in 5'9", the conversion gives an incorrect result. 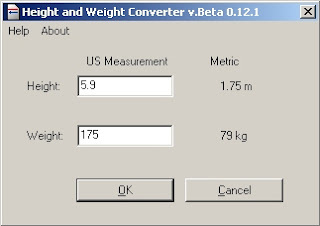 In the future, I plan to allow input in both formats, and also add some other useful features, such as conversion from metric to the US system. If you find this program useful, or if you have any suggestion, let me know. I've uploaded a slightly improved version: the new version rounds the height to two decimals and the weight to the nearest kilo. Also, it is now possible to use keyboard shortcuts to press the OK and Cancel buttons. and it gives you the answer in big and bold before any search results. Works for other measurements too. And for foreign currency. Ti farebbe comodo un piccolo script un po' vecchiotto che fa lo stesso con le misure di lunghezza e di peso? Maybe you could add the option to choose between generic measurements and measurements referring specifically to people, where the results would return only two decimal digits for heights and none for weights, as this is what would be expected in most European countries (not sure about the rest of the world!). Patje - yes, but typing "5 feet 9 inch in meters" takes a lot longer than typing "5.9" and click OK. Also, the main purpose of the program is to have some source code for the exercise. 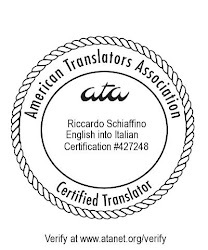 Luigi - yes, thank you very much: could I share it with my students? It would be useful to show them how the same things can be accomplished in different ways. Licia - you are right... and in fact is already planned - but I would like my students to suggest that, and other changes to better localize the application.